On May 2, 1997, self-described Indonesian witch doctor Ahmad Suradji was arrested by authorities after three bodies were found buried in a sugarcane plantation near his home on the outskirts of Medan, the capital of North Sumatra, Indonesia. Ahmad, also known as Nasib Kelewang or Datuk Maringgi, initially confessed to killing 16 women over a five-year slaying period. Upon further searching of Ahmad"s property, clothes and watches belonging to 25 missing women were uncovered. After further questioning, the 48-year-old cattle breeder increased the body count of his 11-year rampage to 42. Ahmad"s three wives, all sisters, were also arrested for helping him commit the murders and hide/dispose of the corpses. The oldest wife, Tumini, was tried as his accomplice in his 11-year rampage. The self-proclaimed sorcerer was revered by locals who believed he had paranormal powers and often asked him for medical and spiritual advice. Many women would hire him to cast magic spells to keep the faithfulness of their husbands or boyfriends. Neighbors said that many women sought the sorcerer"s help believing they would become richer, healthier and more sexually attractive to men. Police believe the victims -- ages ranging from 11 to 30 -- may have been too embarrassed to tell their families that they were seeking the sorcerer"s help, so their disappearances were not linked to him. A great deal of the victims were prostitutes. This serial killer would charge each victim $200 to $400; then he would take them to a sugarcane plantation near his home and bury them in the ground up to their waist as part of a magic ritual. Once in the ground, he would proceed to strangle each woman with an electrical cable. Then he would drink their saliva, undress their corpse and rebury them with their heads pointing to his home so that he would enhance his magical powers. Suradji told police that nine years ago he had a dream in which the ghost of his father told him to kill 70 women and drink their saliva to become a Dukan or mystic healer, he confessed to the authorities. The sorcerer, Ahmad Suradji, was said to be widely respected in his village. Neighbors said he was often willing to help sick villagers and contribute to charitable causes. Nasib, who led police to the bodies in the field next to his home, told officers he needed to kill up to 70 women to gain paranormal/supernatural powers. Now that the unearthing of 40 corpses testifies to Nasib"s true dementia, police have asked residents to report any more missing women and children. About 80 families in the area have reported female relatives missing, leading to fears that more bodies could be uncovered in the future. During the trials, both Suradji and Tumini, denied the slayings, saying they confessed because they could no longer bear torture by interrogators. 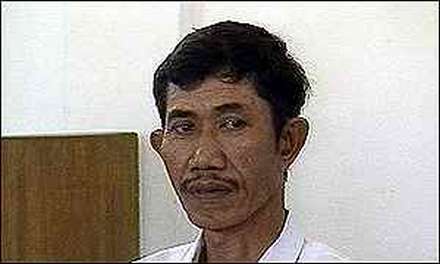 On April 27, 1998, an Indonesian court in North Sumatra found the sorcerer guilty of Indonesia"s worst killing spree. As the last of the 42 bodies were being unearthed, the deadly sorcerer was sentenced to death by firing squad. Ahmad Suradji serial killer is a male serial killer. Dukun AS, Nasib Kelewang, Datuk Maringgi is a male serial killer.